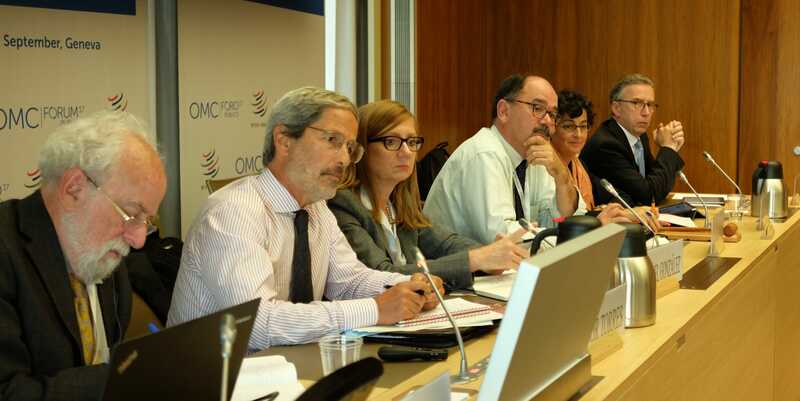 Can Better Institutional Learning Improve the Functioning of the WTO? At the WTO Public Forum 2017, the GED team organised a panel discussion on how improved institutional learning mechanisms could help the functioning of the WTO. Some kind of evaluation would clearly highlight the elements that prevent the smooth running of the WTO’s business – and once the obstacles are clearly named, it will be hard to ignore them. But what is the best institutional learning mechanism? Which options are politically feasible? These questions were debated by Robert Wolfe, Hector Torres, Anabel Gonzáles and Arancha Gonzáles under the chairmanship of Bernard Hoekman. You can watch a recording of the discussion at the bottom of this blog post. Many agree, that the WTO is currently not working as it should. The trade liberalisation agenda is advancing slowly, the dispute settlement body is becoming increasingly politicised and not all member states take their obligations on notifications seriously. As a result, many countries are increasingly frustrated with the multilateral trading system and turn to plurilateral solutions instead. However, the WTO is worth preserving. Only the multilateral trading system can include all countries and thus ensure fair and effective outcomes. But in order to do this, the current obstacles need to be overcome. Improved institutional learning would be one way to achieve this. When the IMF turned to external evaluators, it cruelly exposed the idiosyncrasies of the institution and the reasons for its bad public image. As a result, the IMF changed considerably, addressing the points identified by the evaluator and improving its public image. Could a similar success be repeated with the WTO? Certainly, the IMF and the WTO are very different institutions. The IMF has a strong executive while the WTO is mostly member driven. As a result, decision making in the WTO is much more complex than in the IMF. Obviously, this complexity needs to be done justice in conceiving a suitable evaluation mechanism. An effectiveness test is however not the only test that an evaluation mechanism needs to pass. Since invariably an evaluation mechanism is going to put the finger where it hurts, it might be hard to organise political support for such a mechanism. So an additional test is political feasibility. These two questions, which kind of mechanism is most effective and which kind of mechanism is politically realistic were discussed by outstanding experts at our panel discussion at the WTO public forum in Geneva on September 27, 2017. Speakers are Robert Wolfe (Queen’s University), Hector Torres (CIGI), Anabel Gonzáles (World Bank) and Arancha Gonzáles (ITC).